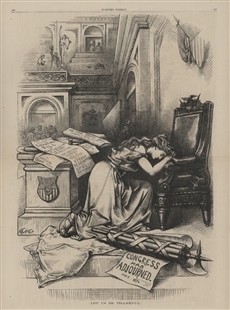 Corruption tainted Gilded Age politics, and nowhere was it clearer than in the Crédit Mobilier scandal, the aftermath of which is illustrated in this 1873 cartoon from Harper’s Weekly. 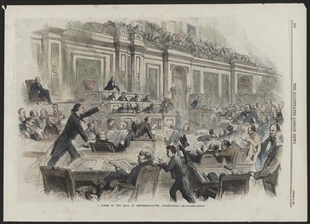 The House investigated the railroad scheme and censured two of its Members for using their influence for personal gain. 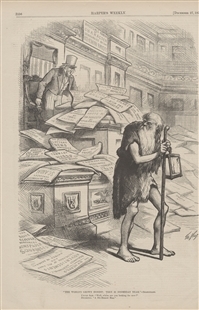 Cartoonist Thomas Nast, however, implied that the resolutions that condemned corruption and buried the House rostrum were no more than a heap of lies. In the foreground, Diogenes, the ancient Greek philosopher endlessly in search of an honest man, turns away in disgust. 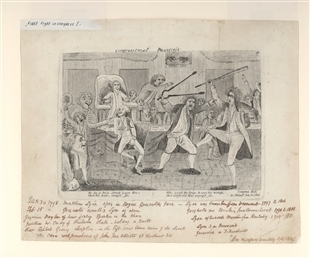 Nast gave great attention to the surroundings in this cartoon, and the rostrum and chair behind it are unusually accurate renditions of the Chamber’s furniture.